No, Vladimir Ilyich and Uncle Joe, you shall not go to the ball seems to be the message given out by the pro-Western government in Albania. 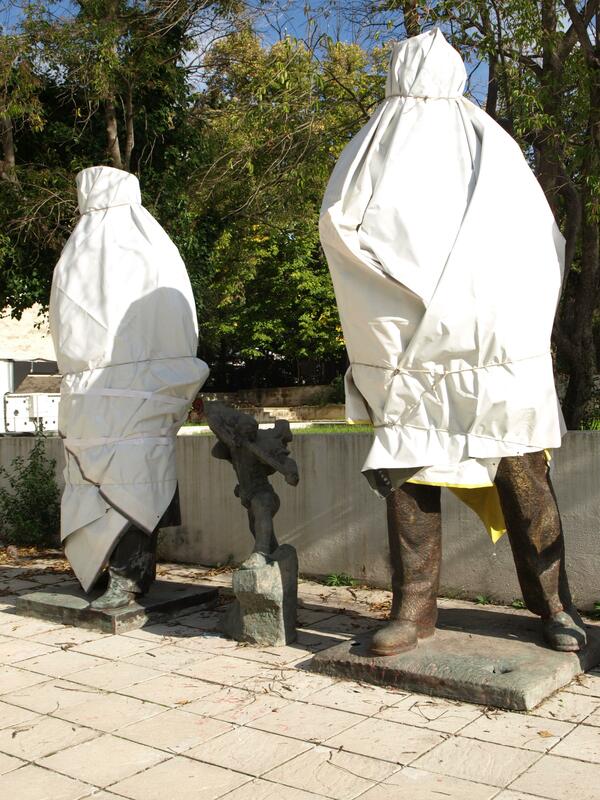 Vladimir Ilyich Lenin and Joseph Stalin are covered up by the Albanian reactionaries in an attempt to prevent them from spoiling their Independence party at the end of the month. 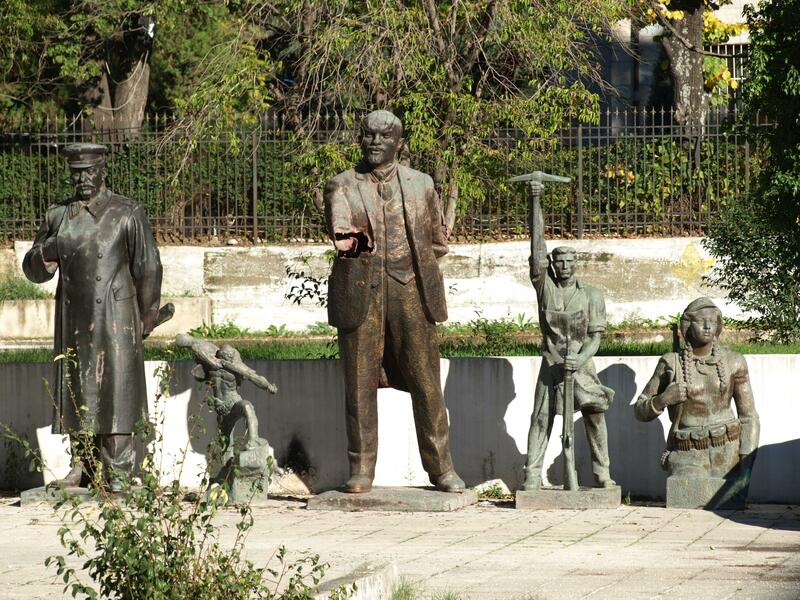 This being my last full day in Tirana and my walk earlier this morning took me past the National Art Gallery I decided to say farewell to the group of revolutionaries hidden away at the back of the building in the impromptu ‘sculpture park’. It was with somewhat of an element of surprise I arrived to discover that Vladimir Ilyich Lenin and Joseph Stalin had been wrapped in tarpaulins and all you could see of them were their legs or feet. The 3 ‘Albanian’s’ remained on show. I thought that this must have had something to do with the upcoming 100th Anniversary event of the declaration of Albania’s Independence from the Ottoman Empire in 1912. This was confirmed by the young girl who was playing in the area (I assume the daughter of the family that cares for the building) who reacted to my laughing by saying it was ‘por la festa’. Every time I think of this I can’t help laughing. The whole idea and situation is beyond ridiculous or farce. In the first place I’m not sure why these statues are still in existence. In my travels and searches throughout the country I have come across few statues of revolutionary fighters and none of the Marxist leaders. So why this little group still remains is a mystery to me. 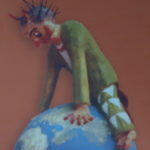 I will describe the group in more detail in another post. I would like to know at what level in the government this decree has originated. And is this a normal state of affairs at this time of year or just because it is ‘The Big Anniversary’. I was here at around about the same time last year and there were preparations going on, especially in Skënderbeu Square, but they have definitely pulled out all the stops this year. As I came around the corner I thought I might have arrived at the time of a kidnapping attempt and was quite relieved that this is only a temporary measure, as I assume it to be. I just don’t understand the mentality of the people who are making these decisions. If these statues are an affront to those in power (which they are as they represent the antithesis of rampant and voracious capitalism and international toadyism) then destroy them. We can always make more in the future. Are the ones in power so superstitious that they think that by covering them up they will cease to exist, that the ideas they represent will somehow just go away? Or perhaps they think that Vladimir Ilyich and Joe will be upset by all the tripe that will be spoken next week and they want to protect their sensibilities? Or are they so feudalistic in their thinking that they fear the ‘evil eye’, the dorlolec? Even though I can’t understand most of what is said in Albanian I think I would be affronted by the fatuous and meaningless statements that will be made to comfort the gullible about the importance of independence. All this at a time when the country is probably lees independent, in a real sense, than it has been in any of the past hundred years. Just like all the efforts that were made in the UK in 2012 to try to create a ‘feel-good factor’ the economic and political problems don’t go away just because you don’t think, talk or even try to deal with them. 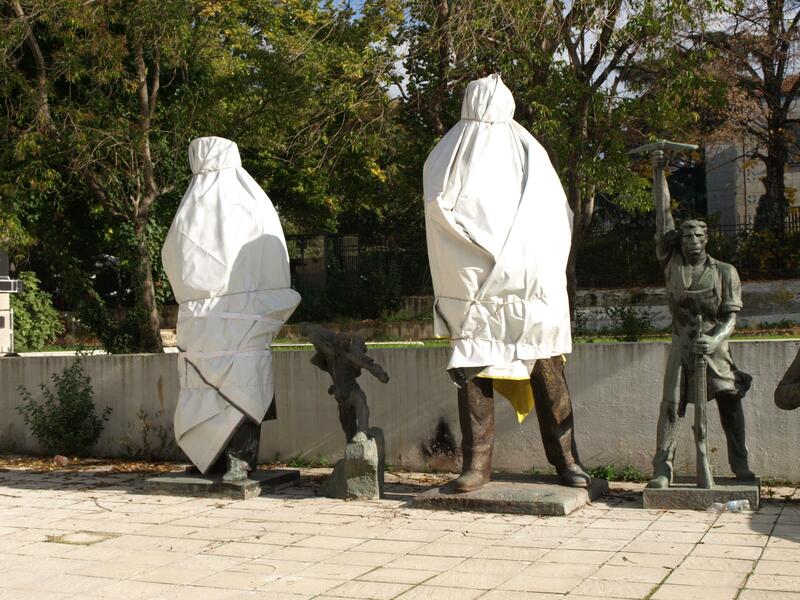 The tactic of covering up these two statues is just a demonstration of the feudal, peasant narrow-mindedness that is the basis for the political philosophy of the rulers of present day Albania. This was shown by the return, last Saturday, the 17th November 2012, of the remains of the self-proclaimed king, Zog, to Tirana. Those in power in Albania have no future to offer the people so they present them with a feudal and subservient past. This entry was posted in Albania, History, Travel and tagged 100th anniversary albanian independence, albania, art gallery, tirana, uncle joe stalin, vladimir lenin by Michael. Bookmark the permalink. Hope your final (at least for this year) days in Albania worked out well. Really interesting! Was nice to meet you in Tirana.